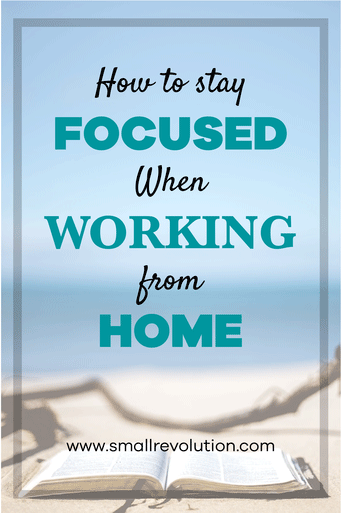 While it is usually considered as a perk, working from a home environment can also be one of the biggest problems you face as you are set free from the constraints of a cubicle and the prying eyes of supervisors and managers. Yes, you can work in the comfort of your own home where every convenience you could think of is within easy reach. 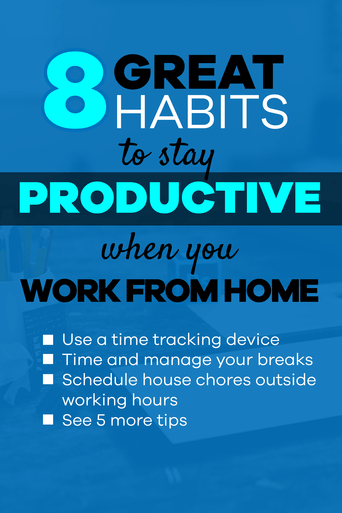 But, in reality, this poses a problem because ‘home’ offers plenty of distractions to keep you from working and being productive. With the presence of entertainment devices, friends on social media and more, your FOCUS becomes a sword that ought to be sharpened on a regular basis. But, it’s exciting to be working from home! Yes, it’s perfectly natural that in the first few weeks of being an online worker you find that friends and family drop in to see you. It is a novelty for everyone, including yourself, that you’re working from home and seemingly available for a chat! During this time, I would suggest that you do take a break when friends stop by to visit. Enjoy the novelty of your new situation, enjoy your new environment and freedom from a cubicle. After a while, friends and family get used to your presence at home and learn to leave you alone. This is the critical point when your own self-discipline needs to kick in. You’ll find yourself drawn to a myriad of usually uninteresting chores, this being one of my favourite comedies on the topic. The trick is whether you will have the control to develop strategies to avoid being drawn into unproductive habits that could eventually lead you to becoming unemployed. Learning to avoid common distractions will be critical to your ongoing success in an online career. The distractions never disappear; it’s a matter of developing your self-control. In this lecture I hope to point out the most common and biggest distractions and give you strategies to remove them from your working day. Yes, you are being watched! Check out the below screenshot. We’ve grabbed this from our own timesheet tool, Hubstaff. It is a real screenshot from a real employee. It is an increasingly common practice for businesses to use timesheet tools to track an employee’s working time. 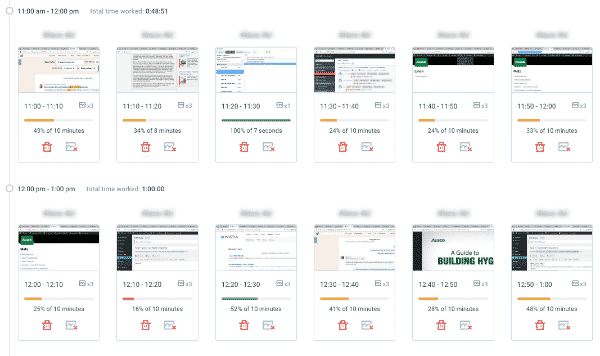 With the growing demand in global outsourcing, more and more timekeeping tools are offering a screenshot feature to help employers manage time. As an employee, when you start using the timesheet tool you will install a small tracking app on your computer. This gives the software access to your screen whenever you are logged in to the system. In this example, Hubstaff takes a screenshot 3 times every 10 minutes and measures the volume of keyboard and mouse movements. The software uses the number of times you move your mouse and also the number of keys you hit on your keyboard to assess your activity level. You can see that one of the screen captures has a red warning line. The red line indicates that this employee had a very low activity level for that 10 minute period. In fact, the employee only worked for 16% of the 10 minutes, which equates to 1.6 minutes out of a total of 10 minutes. Is this a problem? Sometimes yes, sometimes no. It depends on your employer’s attitude and fussiness for detail. Try to understand your employer’s perspective. Would you like to be paid 16% of your promised salary? Probably not! However, would your employer prefer to pay 16% of your salary to compensate for this unworked time? Most likely. Don’t worry. Keep in mind that there is a balance! No one can be 100% productive every single minute and every single hour. It is simply not possible. For example, in our team, our writers often record low activity levels. Why? Because they are reading and thinking. When a writer wants to learn about a new topic they will need to read many web pages. Reading takes time and this can show as low activity due to the low number of keystrokes. There’s not a lot of keyboard activity when you are thinking! Another example, if you are a web developer then sometimes you’ll be reading research articles to help you solve a technical problem. Again, this means that you’re just reading and thinking and it shows as a low activity level. Your goal is not to get too hung up on the idea that you are potentially being watched when you work. 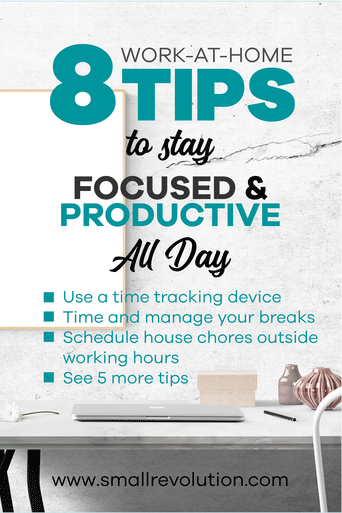 Instead, focus on avoiding common distractions and ensuring that your timesheet is always full of the screens that show you are working on the project at hand. It’s up to you to demonstrate that you have the maturity and tenacity to concentrate on your work and ensure that you have a reasonable activity level in your timesheets. Here are some of the most common distractions and strategies and tools for overcoming their enchanting siren call! Yes, you need the Internet in order to work, but carelessness with your time can often lead you to reading personal emails, updating your Facebook profile or watching HILARIOUSLY FUNNY epic fails in YouTube. Even when you’re reading articles and researching for a work task, you may end up simply surfing – going from one “resource” to another and not getting quality work completed. This is called “being sucked down the rabbit hole” and it never ends well! You click on a link, then another link and another until you find yourself on a webpage totally unrelated to the task you ought to be working on. Take action! Use tools to force discipline until habit kicks in. There are a few ways you can avoid being distracted by the Internet when you first become a virtual worker. If you need help disciplining yourself, you can use Rescue Time. This tool keeps track of how many hours you spend on one application (e.g. Facebook, Pinterest, YouTube, Microsoft Word, etc.) so you can review and pepper yourself with guilt at the end of the day. 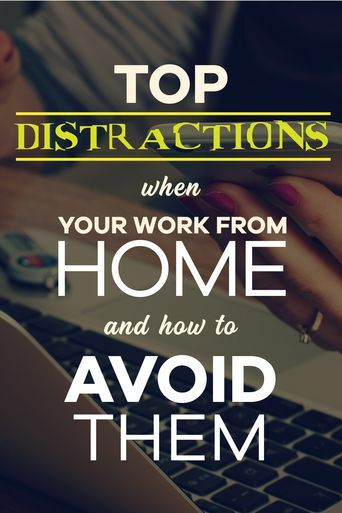 It also allows you to block distracting websites so you can never ever visit them, and even set alerts to remind yourself to get back to work. 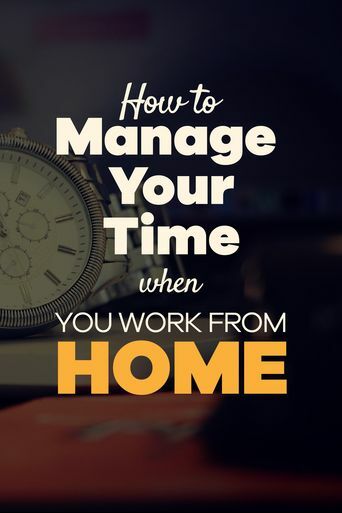 If you are new to working from home it’s a good idea to run Rescue Time for the first month. Only you can see the data so there’s no need to be embarrassed by what it reveals, but it will help you self-assess how you actually spend your time each day and then you can make adjustments. If you’ve been employed via Upwork you’ll know that there is an in-built Time Tracker that takes screenshots of your computer monitor at random. These screenshots are available to your employer and work in the same way that I’ve described above. Other time tracking software applications such as Hubstaff do the same. With team monitoring systems in place you’ll think twice before opening your Facebook page while working. Over time, with the reinforcement of behaviours offered by the tools, you’ll soon find that it becomes more natural for you to focus your energy on the work task at hand rather than surfing the web. While there are some people who prefer working in a quiet place, there are those who like working with the TV or the radio on – accordingly, they believe it helps them to be more productive. While this can be true, I believe that television is distracting for most people. More often than not you’ll find yourself singing the lyrics of a song and totally forgetting what to type next, or glancing at the TV every now and then before you notice it you’ve basically watched the whole show! You may not think that it has an effect on your work, and your employer certainly doesn’t know that your television is on, but if you’re truly serious about an online career you’ll learn to work without the television being on. Imagine the best entrepreneurs, the best online workers – what is the chance that they are so effective because they have the television running in the background? Zero chance. Turn it off. Take action! Turn off the television, cellphones too. Can’t turn it off? Is the temptation truly too strong? Make yourself a home office, somewhere far away from the television. The television, in many houses, will either be in a family room or a bedroom. You don’t need to work in those areas. You can work in the garden or a dedicated work study, just as long as you stay away from the remote control. If your family insist on having the television turned on then that is a clear indication that you need to create a working space in another room. If you feel like you’re going to miss your favourite television show then invest your new salary in a recording device. Save the show for later when you’re having a well-earned break. Learn which work values you should hone and prioritize. Download and answer this Work Values activity cheat sheet. Everybody needs a mental break every once in a while, especially after hours of tapping away at the keyboard or staring at the computer screen. Breaks are good for your mind, as they give you a chance to refresh and rejuvenate, but if they get too long, you’ll find that your work suffers and ends up unfinished. Don’t get distracted and end up on a long break. When an employer runs time tracking software, many of these tools have an Activity Monitor built in. Not only does it monitor your keyboard and mouse movements, but it also tracks idle time. Keep in mind that the employer can also set the idle time to be unpaid time. Idle time can be triggered automatically within just a few minutes of you leaving your keyboard. You think you’re ducking away from the computer for a few minutes and it won’t matter. However, it shows in the time tracking software as many small gaps in your work. It shows that you can’t concentrate on your work. Your best work is always produced in steady, concentrated efforts, not small quick bursts. It’s a good idea to take a break, but make sure a quick break doesn’t turn into a long break. Take action! Time your breaks. Idea 1: Set an alarm. You don’t need more than 15 minutes to make and drink a cup of coffee or do some stretches. Set an alarm to remind you that break time is over, and when it does go off, be sure to head back to your desk (bring your coffee with you, if need be). Idea 2: Plan your breaks ahead of time. Perhaps decide that you’ll be breaking at 11am, 1pm and then 3pm. Work towards those break times and try to get batches of work finished before then. Or, take a break when you have completed a particular task. Choose a natural time to break rather than just letting your mind wander away from your work. Working at home means house chores are smack bang in front of your eyes. 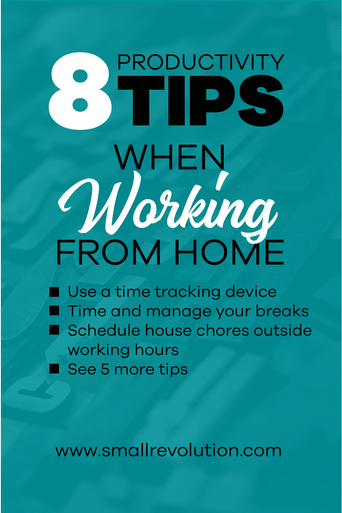 There’s laundry, dishes, vacuuming, children to attend to – all those other little demands that can eat up a huge chunk of your working time. You cannot avoid these unless you have a housekeeper, but then again, you’re working as a freelancer and most often than not, budget is tight! Take action! Manage your chores outside work hours. Set aside time for work and time for chores. Make a schedule and stick to it. The next lecture in this series – Create a regular routine – will help you manage your time allocation for chores. 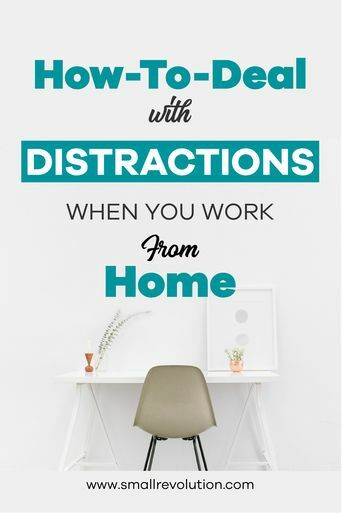 Sad as it may sound, family and friends can also be a distraction when working as a freelancer. There are constant phone calls asking how you’ve been, kids wanting to play, relatives wanting to drop by and so on (especially so when they don’t agree that being a freelancer and working at home in your pyjamas is a “real” job). Family and friends are one of the hardest distractions to handle as you’re not just managing your time; you’re managing theirs as well. Take action! Set your boundaries. Give them signals and “The Talk”. True, freelancing may not seem like an actual, paying job because it’s so AWESOME but it is. You need to make them understand this, and that they need to see and respect your wishes regarding time spent. They will only think this if you think it first! Lead the way and show that you’re serious about your online career. Say “no” when a relative drops in to visit. Give them The Talk. After all, whatever money you’re earning is bound to be enjoyed by them too, right? 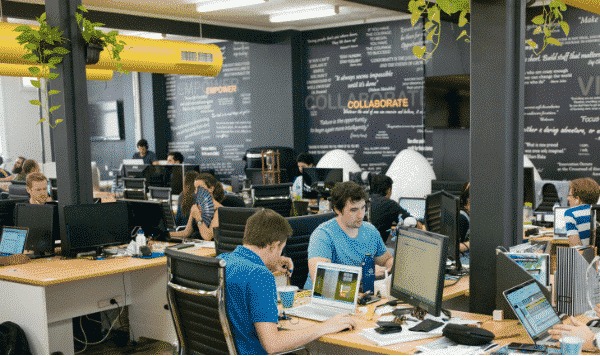 For many years I’ve worked in a wonderfully vibrant, Sydney-based co-working space called Fishburners. There are around 400 people working over the 4 storeys of an inner city warehouse. Everyone sits in an open-plan space, cheek to jowl, right next to each other. You can just about breathe on the person next to you and in front of you. Everyone is very close by! With so many people it means that the noise levels can become a distraction and it also means that there are plenty of people willing to distract you with a pleasant, friendly conversation. So, how do we get any work done in a noisy, sociable environment? There is an unwritten rule at Fishburners. **If you have your headphones on, then it means you shouldn’t be disturbed. ** Everyone knows the rule. Some people don’t have music playing in their headphones; they just use the headphones as a clear indication that they are concentrating on their work and don’t wish to engage in chit-chat. Personally, I have gotten so used to having earbuds either in my ears or headphones on my head that I can actually concentrate better with them than without them. It is just a matter of turning a new behaviour into a habit. If you are working in a home environment and you don’t wish to be disturbed by family, friends, neighbours or the dog barking next door then invest some of your new salary in a pair of good quality headphones. Teach the people around you that when you are sitting at your work desk, with headphones on, it means that you should not be disturbed unless it is really, really, really, really important and can’t wait a single minute more. Use your common sense to judge when being interrupted is important. Gently remind your friends and relatives about the headphone ‘rule’ if they keep forgetting how important your work time is to your ability to earn an income. If you need to be a bit more forceful with communicating your unavailability then a door knob hanger or door poster could be a good strategy for you to employ. Simply print the design that you like best and stick it in a visible position, preferably eye level for the person about to enter into your working space. Keep in mind that sometimes an amusing or funny message can defuse a potentially hurtful situation. You wouldn’t like having a door figuratively slammed in your face; same goes for other people too. Action 3: You have to have The Talk! There’s no two ways about it. You can’t avoid it. And if you’re serious about having an online career I strongly advise you to not avoid having The Talk! I know it’s difficult, and perhaps seems confrontational or over-the-top, but if you use a friendly tone to tell your family and friends that they need to respect your working space during business hours they will inevitably support you in the long run. Here’s a short example script that will give you some ideas as to what you can say to family and friends, and hopefully give you courage to have The Talk! In fact, the job I want/have didn’t even exist a few years ago! Technology and the global economy has made it possible for me to work from home and still earn a good income. But, I need to find a balance between the hours I can concentrate on work and the time I spend with family and friends. I need to know that I can work from home, uninterrupted. If I worked in a ‘real’ office environment and my family turned up and asked questions or asked me to run errands my boss would not be happy. The same is true for my home office. I need to be able to work, uninterrupted. At this point, you can use some of the strategies we’ve outlined above such as headphones on means no interruptions. Or, do not disturb sign, means no interruptions. 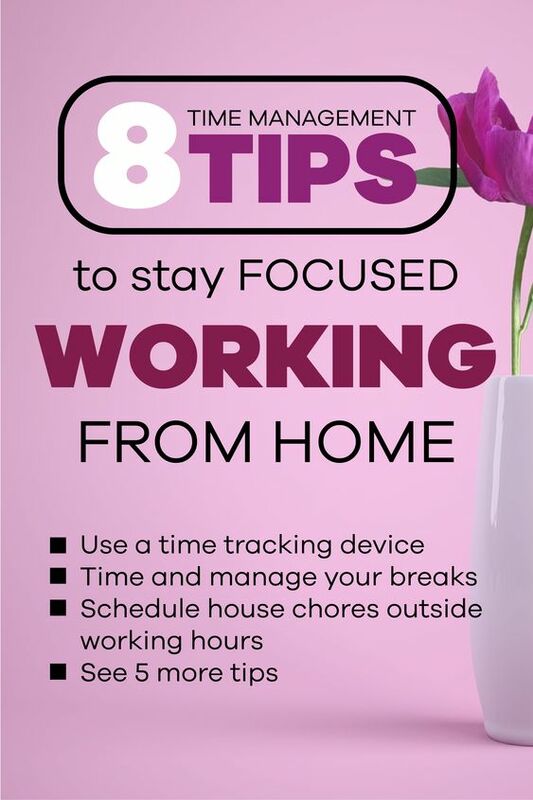 With these common distractions, finding your focus and keeping it can be difficult. But just like everything else, focus also needs practice. All these solutions may make it look like it takes the “free” out of “freelancing” but they are necessary if you are to enjoy a successful and long-term online career. I’ve learned to manage most of my distractions pretty well, but even after 18 years of working from home I still get distracted by the laundry. Usually it’s the towels. I’ll notice the bathroom hand towel needs replaced, toss that in the hamper and grab a new one, notice the hamper was pretty full, so I go throw them in the wash.